This statistic displays the proportion of individuals who currently smoke cigarettes, cigars, cigarillos or a pipe in selected European countries in 2017. In this period, Greece had the highest proportion of smokers in the EU with 37 percent. Cigarette prices differ across Europe: the most expensive country in which to purchase cigarettes is the United Kingdom (UK). 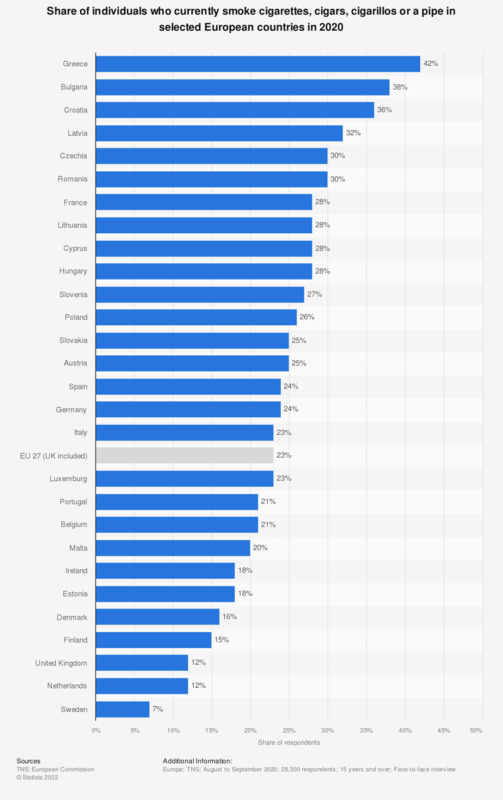 Cigarette prices in Europe are driven by the respective taxes imposed within each of the member states and consist of a specific duty per 1,000 cigarettes and an ad valorem rate onto the recommended retail price, in addition to value added tax (VAT). Thus the highest rates of taxation are reflected in the retail prices. Similar rates of taxation between countries are also found for hand rolling tobacco, where the highest levels of taxation are found in the United Kingdom once again. Governments that impose such strong barriers to the purchasing of tobacco are considered 'nanny states', with high levels of control on other factors, such as advertising, bans of tobacco products on retail displays and graphic warnings on cigarette packs. Exact formulation of the question: "QB1 Regarding smoking cigarettes, cigars, cigarillos or a pipe, which of the following applies to you? In this question and the following questions in this section, smoking cigarettes does not include use of electronic cigarettes." Which of the following products did you use or try first?